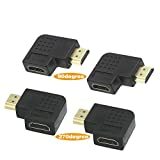 The angled HDMI adapters avoid bending your HDMI cables excessively which may damage the cable or even worse the ports on your expensive equipment. Fully compliant with the latest HDMI standard, these flat right angle HDMI adapters are capable of carrying the increased bandwidth of HDMI 2.0 at 18 Gbps. Gold-plated connectors that resist corrosion while offering optimum signal transfer. Support resolutions up to 4Kx2K including 4096x2160, 3840x2160, 2560x1600, 2560x1440, 1920x1200, and 1080p. Support Audio Return Channel, HDMI Ethernet Channel and 3D.